1. The pulse of intense electromagnetic radiation generated by a nuclear explosion. 2. A pulse of electromagnetic radiation emitted by certain devices such as citizen band radio and cellular phones. Many security experts feel that the bigger threat could be if nuclear weapons are used to cause high-altitude electromagnetic pulses (EMPs). If detonated in the high atmosphere, a nuclear weapon releases a massive burst of electromagnetic radiation that causes electronic systems to produce crippling current and voltage surges. Such blasts are known as EMPs. If a weapon was used over the likes of London or New York, it would cause computer system to completely crash plunging the city, and in turn the world, into an economic shutdown, not to mention the chaos caused by traffic, communication and energy networks shutting down. As such the British and American governments have begun to look into ways to defend against such an attack. In America, the International EMP Council is dedicated to coming up with ways to protect the US’s infrastructure against the risk of an EMP attack. The group includes scientists from around the world as well as government and security officials. On Monday, Avi Schnurr, the president of the International EMP Council, attended a briefing in London regarding the threat of a High Altitude Electromagnetic Pulse. He confirmed that if such an attack took place power, water and phones could fail, essentially plunging the country into The Dark Ages. He also said that the worldwide economy could be shut down with full recovery taking between four to eight years. As such, the monitoring of such a potential attack is a high priority to the US, who believe the greatest likelihood of such an attack comes from North Korea and Iran. In terms of the West’s defence against such a weapon, Mr Schnurr stated that it was “just at the thinking and planning” stage and more action needed to be taken. FOR CONGRESSIONAL TESTIMONY ON THE EFFECTS OF EMP. CLICK IMAGE BELOW. You have probably never heard of an “EMP.” Don’t feel bad—a lot of people haven’t. If asked, most would probably respond it’s some sort of “Emergency Medical Something,” or maybe even a new, cool rock band. Could it have something to do with ESP, or be one of those texting abbreviations teenagers use? In fact, it’s actually a deadly serious matter—and something you need to know about. Just imagine that one bright, sunny day everything electrical just stopped working. The lights go out in your home or office. There is no cell phone or Internet service and, tragedy of tragedies, the coffeemaker won’t work. All the modern electrical conveniences we take for granted on a day-to-day basis in the 21st century go kaput—without an obvious explanation. And as a result, modern life as we know it comes to a virtual standstill. Sure, it could be a power outage. That happens when the weather is bad, which it’s not on this particular day. The power company could be working on the lines, but they aren’t. And even if they were, that might not account for your cell phone outage or the fact your car—and the others on the road—all died at once. Aliens from outer space? No. An electromagnetic pulse—or EMP. You were not aware of it, but American military, intelligence and homeland security forces had been tracking a foreign merchant vessel, operating off the East Coast of the United States. In fact, just before everything went dark, the ship opened the large cargo doors on its deck and launched a ballistic missile into the sky in the direction of the American shoreline. Aware of the launch from high-tech, spyin- the-sky satellites, but unable to take out the missile due the lack of a comprehensive missile defense system, the U.S. military attempts to conduct a counter-strike on the freighter before it launches another missile. That is until the missile’s warhead explodes high in the atmosphere over the central United States, releasing an EMP— and destroying unprotected electrical and computer capacity within its effective radius. For a moment, it almost seems like the summer of 2003 when a surge entered the Northeast’s electrical grid, leaving 50 million Americans without power, forcing businesses to shut down operations—from Wall Street to Main Street. But this time it is worse because it’s an EMP attack by a hostile power. As a result, the country’s three main—and interconnected—electrical grids are rendered useless due to the EMP, possibly leaving the entire country without service within seconds, according to experts. Moreover, in the blink of an eye, U.S. military forces within line-of-sight of the EMP—up until this moment the world’s most potent, computerized, and capable force—is now practically out of business. With electrical circuits fried, hospital equipment stops; nuclear power plants are in jeopardy; and there are no emergency services to respond to your calls for help. In fact, you can’t even call for help—911 is gone. Depending on the size and number of EMP bursts over America, this is only the beginning of our woes. With the destruction of America’s electrical and computer systems, there will be severe water, food and medicine shortages, some experts believe. One estimate suggests a major EMP attack would push American society back 100 years technologically and could lead to the death of a large portion of the population in a relatively short period due to an evolving inability to deal with such things as the spread of illness, among other problems. Indeed, a U.S. government-sponsored study by the Commission to Assess the Threat to the United States from Electromagnetic Pulse Attack (hereafter: EMP Commission) concluded that within just one year of such an attack 70 to 90 percent of Americans could be dead from starvation or disease. While this sounds like something out of “The Twilight Zone,” it’s not. The possibility is real—and the threat of EMP is here and now. According to scientists, an EMP is a high intensity burst of electromagnetic energy caused by the rapid acceleration of charged particles, usually from a nuclear detonation. The explosive pulse would likely occur in low-atmosphere, at an altitude between about 25 miles to 250 miles above the Earth’s surface. After the nuclear fireball, the initial “electromagnetic shock” disrupts or damages all electrical systems over a very large area within less than one second. Then, on top of this, a lightning-like effect hits the electrical networks, which further damages the already near-crippled power infrastructure. Finally, building on the previous damage, a longer-duration pulse then sends an electrical current through electrical lines, damaging distribution centers, ultimately destroying the target’s electrical grid—and anything attached to it. For instance, according to some estimates, a one-megaton nuclear blast exploded at several hundred miles above the center of the country (e.g., Kansas) could affect electronics from sea to shining sea. Moreover, detonation of a nuclear weapon in space would create an EMP that would cripple any satellites in line-of-sight of the explosion, leading to the crippling of any public or private system that relied on space assets. EMP weapons do not hurt people directly since they are likely to be out of range of the heat and pressure from the blast. Plus, depending on the EMP strike scenario, not only might it be difficult to know who the attacker is—and possibly for some time—you may not have the ability to retaliate or, worse yet, prevent another attack. The EMP threat isn’t new; awareness of it goes back to the early days of nuclear weapons testing that took place during World War II. But the EMP was considered to be insignificant in comparison to the devastation of the heat and overpressure of the infamous mushroom cloud on people, equipment and buildings. In addition, militaries and societies were much less electrified, and the computer was in its earliest days—never mind the Internet. But it’s believed both the United States and the Soviet Union came to understand more fully the effects of an EMP in the early 1960s when they still tested nuclear weapons above ground. 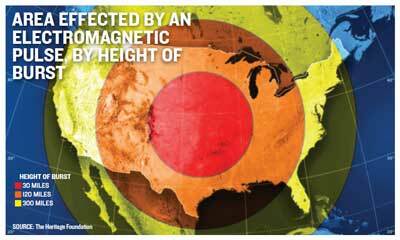 Both countries actually noticed the significant effects of an atmospheric nuclear blast on electronics and electrical transmission lines even hundreds of miles from their test sites, leading them to consider using nuclear weapons for EMP purposes against the other. As a result, the United States began to “harden” its military equipment against a possible Soviet EMP attack. The Russians also took steps, worried about a devastating American strike on the Soviet Union. But that was the Cold War, so where is the threat coming from today? Russia could still be in the game. It has a prodigious nuclear and ballistic missile arsenal; it’s also reportedly still doing research on EMP. Some insist Moscow is taking steps to protect critical infrastructure against EMP, hardening civilian and military equipment, and providing training to military personnel. Another major nuclear power, China, is reportedly working on EMP weapons and associated advanced technology. Beijing may even be going beyond using a nuclear detonation to create the EMP effect, instead developing a radio frequency weapon, such as a high-power microwave, to obviate the need for an atomic blast. In addition, though an EMP-inducing radio frequency weapon’s effect would likely be more localized than a high-altitude nuclear detonation, it would eliminate the moral dilemma of lighting off an atomic weapon in anger. Indeed, Chinese military writings have reportedly looked at a Pearl Harbor-like attack against the United States using an EMP weapon (and cyberwarfare) as part of its evolving asymmetric defense strategy. Nuclear North Korea is, of course, another possibility. Pyongyang has a significant missile arsenal capable of reaching neighboring U.S. allies Seoul and Tokyo and may have the ability to hit both Anchorage and Honolulu. Iran may actually be the most worrisome, though, especially considering its disdain for the United States. It’s almost certainly working on developing a nuclear weapon, despite its assertions to the contrary to the international community. The Pentagon has estimated that—with sufficient foreign assistance—Iran may be able to threaten the United States with an intercontinental ballistic missile (ICBM) strike by 2015—a short five years from now. Of course, considering the opacity of the Iranian missile program, it could be sooner than that, too. Also of concern is that Iran has been exploding ballistic missiles in flight at an unusual point in the missile’s trajectory that some believe could be part of a high altitude test for an EMP. Tehran has also done similar testing from sea-based platforms in the Persian Gulf, leading people to believe it was simulating an EMP strike from a ship. Additionally, there is the ever-present threat of terror groups obtaining EMP related technology, particularly since tactical (also known as battlefield) nuclear weapons have reportedly been available on the black market for decades—although one of these so-called “loose nukes” has yet to be found. Al Qaeda, for instance, has been intent on obtaining weapons of mass destruction in an effort to repeat the likes of 9/11, resulting once again in the mass slaughter of innocent civilians. Besides innocents, it also has seen the American economy as another lucrative target, making an EMP attractive. In fact, a 2008 Congressional Research Service report on EMP noted a 2007 study of the potential economic impact of this type of attack on the Washington, D.C., metro area. It assessed that an EMP strike would cause an economic output loss of nearly $800 billion (7 percent of the nation’s annual gross domestic product) and affect some 5 million people. The advanced state of our society is both a blessing and curse. We’re the great and powerful nation we are today because of our ability to develop and harness advanced technologies, including those involving electrical power. But this strength is also a weakness, presenting a highly-exposed Achilles’ Heel to potential foes. Due to the tremendous damage an EMP attack could cause, according to experts, recovery would be intolerably slow, especially for the private sector and states since little or nothing has been done to address a potential EMP strike at those levels. Moreover, while recovery from an EMP strike would be arduous due to the rolling effect across various critical infrastructure systems, analysts also worry about availability of repair materials (e.g., replacement electrical parts) and the skills required to operate the country’s vast infrastructure, perhaps even manually. The EMP Commission also concluded that we’re rapidly losing our technical knowledge of EMP and that efforts by the federal government, national laboratories (e.g., Los Alamos, Livermore and Sandia) and industry are needed in order to be able to defend against, and respond to, an attack. But ignoring the evolving, indeed resurgent, threat won’t make it go away. Another important effort should be developing and fielding a comprehensive missile defense system for protecting the homeland by having the ability to take out a ballistic missile that is carrying an EMP (or any other) warhead before it explodes. Preventing an attack is much less costly than responding to one. It also makes sense for the intelligence community to do a comprehensive threat assessment of EMP, so we know exactly what—and who—we are up against, in addition to the important work of the EMP Commission. And lastly, EMP Commission members have been vocal in such fora as congressional hearings in pointing out that, since our vulnerability to EMP is well known, a lack of effort to publicly address the threat, identify and take steps to reduce our vulnerability, could lead potential adversaries to exploit our lack of preparedness. Considering the threats we face, the last thing we should be doing is encouraging—even passively—those that might do us harm, especially using something as potentially devastating as an EMP. The time to do something about EMP—at a minimum a weapon of mass disruption if not destruction—is now.